There were a few crucial things that attracted me to Welcome To The Show: 17 Horror Stories – One Legendary Venue and led to me asking the publisher, Crystal Lake Publishing, for a review copy of the anthology. The first thing was the impressive number of first-class, and even legendary, horror authors that were listed as having stories published in the anthology; any collection that includes the likes of Jeff Strand, John Skipp, Rachel Autumn Deering, Max Booth III and especially Brian Keene, is guaranteed to provide some high-quality horror tales. The second thing that got my attention was the idea of all of the stories in some way revolving around the same location – in this case, a dingy and mysterious club in San Francisco called The Shantyman. I have a particular fondness for anthologies and collections that have authors working around a shared character, location or theme, particularly as they don’t seem to happen as often anymore, and the idea of having so many stories intersect with this club and its inhabitants seemed like an especially inspired idea. Thirdly, as always, was the anthology’s cover art which is always something I highlight. I’ve really liked the cover illustrations for previous Crystal Lake Publishing titles that I’ve read, and the artist deserves to be commended, because this is one of the best that I’ve seen from the publisher. 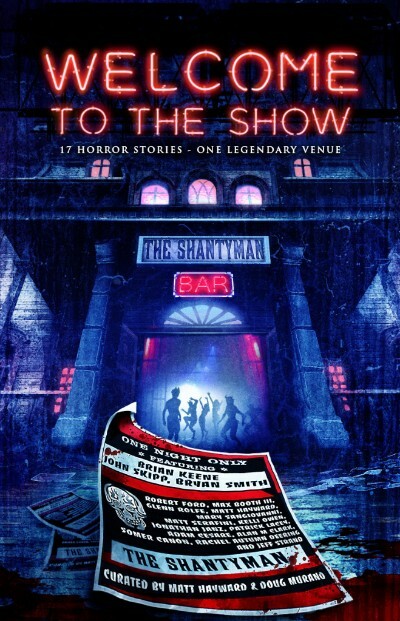 The shadow-soaked entrance to The Shantyman lurks in the middle of the piece, enticing in both the reader, and unfortunate souls that can be seen dancing within the club, and blood-red neon lights announce the anthology’s title. A garish, blood-spattered flyer for the club, seemingly blowing away in the wind, is a clever device used to list the authors and editors in the collection. It’s a gorgeous piece of art that obviously took a lot of skill and creativity, and I’d quite happily pay for a print to place on wall of my study. Looking then at the content within the anthology itself, there are a total of seventeen short stories, and one of the strengths of this anthology is the variety of types of Horror it encompasses, ranging from Quiet Horror to Cosmic Horror and even the occasional hint of Splatterpunk. There’s also a nice mixture of approaches to the stories involving The Shantyman, with tales that involve time-travelling serial killers, post-apocalyptic alien invasions, traditional-style ghost stories, and quiet, psychological horror. It’s a highly impressive and wide-ranging anthology that shows that the editors weren’t afraid to embrace the entire spectrum of the Horror genre, and accordingly not be limited by a particular approach. Usually when I review an anthology, it’s my standard practice to only to highlight stories that I particularly enjoyed, or which affected me in a certain way; that was rather difficult in the case of Welcome To The Show because the quality of all of the stories was incredibly high. There were some stories, however, that particularly stuck with me after I’d finished reading. Night and Day and In Between by Jonathan Janz is one of the first stories in the collection, and it’s a deeply atmospheric piece of writing that twists and turns as you read it; it starts out feeling like a standard piece of noir detective fiction, with a PI sent to find a missing woman who sings in The Shantyman, only for Janz to start playing with your perceptions, making you question the reliability of the narrator, with a twist ending that I really enjoyed. Pilgrimage is written by Bryan Smith, and impressed me with the creativity on show; it’s another story that plays with reader expectations, and introduces an antagonist with a distinct and rather memorable method of killing that reminded me of a certain set of villains from modern Doctor Who. Just over a third of the way into the anthology, you encounter A Tongue Like Fire by Rachel Autumn Deering. Not only is this by far the best of the stories to be found within Welcome To The Show, it is perhaps the finest piece of horror short fiction that I have ever read; it’s been over a week since I finished reading the anthology, and this story continues to haunt me, especially the ending. Detailing its contents risks ruining the tense atmosphere that Deering deftly constructs, but it deals with the nature of loss and grief in a very personal, very raw way, looking at the depths and paths that a parent’s grief will take them, and the story as a whole is heart-breaking. Dark Stage, written by Matt Hayward, is another story that takes a very personal turn, looking at the ravages of old age and how health can deteriorate; and the desire to once again be pain free. It has an interesting take on the ‘Bargain with the Devil’ trope that I haven’t seen done previously, and I look forward to reading more stories from the author. Kelli Owen provides a slow-paced and atmospheric slice of horror with Open Mic Night, skilfully riffing on the ‘27 Club’, the idea that there is a conspiracy around how a number of famous and talented musicians have died at the age of 27, at the peak of their fame; Owens introduces an occult element to the conspiracy theory and centres it around a mysterious stranger who visits The Shantyman to see these talented individuals, and the desperate attempts by a staff member to stop these deaths from occurring. Moving towards the end of the anthology, we come to True Starmen by Max Booth III. I have come across Mr Booth’s horror fiction before, and I knew going in that I’d find a darkly humorous tale with a wicked edge to it, and I was not disappointed. Telling the story of a strange cult arriving at The Shantyman, purportedly to attend a podcast, Booth expertly plays up the bizarre and black comedy in that idea, before pulling the rug out from under your feet with an abrupt ending that is simultaneously disorientating and hilarious and had me desperately stifling laughter on a packed train to London. Just as disorientating, and with a comedic edge to it that is so dark as to be almost impenetrable, is Parody by Jeff Strand, who provides the tale of a musician trying to break into the music circuit at The Shantyman by performing unique song parodies; Strand writes beautiful prose, and he easily takes the reader into the mind of a desperate and distinctly unhinged performer determined to be noticed no matter what. I was absolutely not expecting the story to take the turn that it did, and it took several re-reads to appreciate just how subtly Strand had built up to those final few moments in the story. The two tales that end the anthology are some of the best in the collection, and were well chosen by the editors. Firstly comes Running Free by Brian Keene, a breezy, almost casual first-person story of a dying mobster who decides to try and kill himself in a rather unique way once he finds out that he has an incurable condition. Keene’s pacing is pitch-perfect here, cleverly laying out the protagonists’ plan to kill himself in the first few pages, and then drawing out the tension as attempt after attempt fails; I became engrossed in the story, Keene creating a protagonist who’s genuinely likeable despite his occupation, and it was a genuine shock when the overt horror elements of the story slowly began to appear. The ending to the story is deliciously ambiguous, and it deserves multiple rereads to really get the most out of it. Finally, Mary SanGiovanni closes out the collection with We Sang In Darkness, a brilliant piece of cosmic horror which sees a small group trapped in the ruins of The Shantyman in the middle of the apocalypse. At first believing themselves to be alone, they encounter a strange alien creature in a enclosure on the stage of the club, and slowly but surely reality begins to warp around them, particularly for the unfortunate protagonist. It’s a deeply creepy and slow-burning story that I loved, because almost nothing is explained – there’s little clue as to what is causing the apocalypse or its strange, music-related trigger, and only the faintest inkling as to what the creature is, or why it’s confined to the club. Even the ending is satisfyingly mysterious, the protagonist left with little idea what has happened, and only the slightest shreds of their sanity left intact. A deeply impressive and highly accomplished horror anthology, Welcome To The Show features some highly inventive takes on the horror genre, readily taking advantage of the intriguing theme of a shared location in the mysterious and blood-soaked boards of The Shantyman. The stories contained within the anthology effortlessly range across a broad spectrum of subgenres, and there’s something in it for every reader of horror fiction regardless of their tastes. The quality of the collection is obvious from the moment you see the cover art, and the tales within are consistently high-quality, both in terms of their prose and the depth and breadth of imagination on display. Deserving to be on the shelf of any discerning horror fan, Welcome To The Show might just be the best anthology that Crystal Lake Publishing has ever published, and highlights just how much of a mark the publisher is making on the genre.